Whether running a marathon or completing a charity benefit walk, athletes spend a lot of time surrounded by the small details of race events: registration tables, water stations, course markings, finish lines. But no matter how many events they've completed, it's safe to say that few athletes have thought about those details as deeply as Ryan Griessmeyer, owner of Race Day Events, LLC. With over 10 years of experience as a competitive triathlete and coach and five years of experience as a race director, Griessmeyer started Race Day Events to help with the logistical details that can drive any event organizer to distraction, such as how to convey course information, handle start and finish line crowds, and keep both participants and onlookers safe. A major component of his business is equipment rental. "We are a one-stop-shop for anything and everything - from timing, to all the equipment needed to put on a running race or triathlon - or anything between there as well," said Griessmeyer. Need a fifteen-foot-tall inflatable arch that can handle hundreds of runners? Not a problem. How about 600 orange cones for course marking? Tents for the post-race picnic? Or perhaps a 5,000-watt gas power generator would help the day go more smoothly. These are the equipment logistics that are needed to bring an event to reality, and when Greissmeyer commissioned Focal Flame photographer Clint Thayer to help document Race Day Events equipment and services in action, Thayer jumped at the opportunity. "My initial impression of Ryan's events are that they're very well planned out. They're planned out from the standpoint of someone who actually has participated in events, so he knows where and how and when things should actually happen," said Thayer. "His crew - they know what they are doing, and they know what needs to get done. It's impressive to watch." For the commercial art shoots, the objective was threefold: document the well-established Lake Monona 20km running race, capture the spirit of the new and already wildly popular Mud Run, and illustrate Race Day Event rental equipment in action. The weather was pitch-perfect for the 32nd annual Lake Monona 20km run on May 1, but the tranquil skies belied the fact that the just four years previously the event was almost permanently shut down. "The [former] race director just wasn't interested in taking it on any more, he decided it was time to give it up. Nobody was really stepping in to take it over," said Griessmeyer. Having gathered some race directing experience during his time at Fleet Fleet Sports in Madison, Griessmeyer decided to take on the challenge. "I thought it was a good idea to step in and make it happen and we've grown it quite a bit since. When I took it over, the race had about 300 to 350 [participants]. We hit 900 this year," said Griessmeyer. Focusing on attracting new sponsors and making the atmosphere more festive, Race Day Events added post-race entertainment including a live band. "We made it more of an all-around festival than just an elite running event," said Griessmeyer. a completely whimsical combination of a 4.6 mile run, obstacles, beach-themed costumes, and - of course - a giant mud pit. "The inspiration came from the Muddy Buddy, which is actually a bike and run in the Chicago area," said Griessmeyer. "But I did some research on the internet and also came up with my own ideas, gave it my own twist." 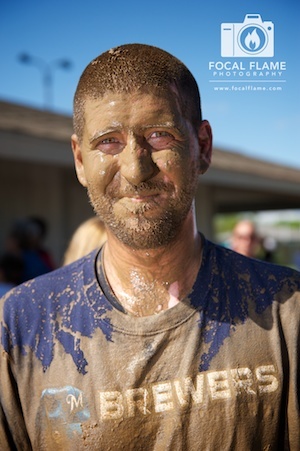 Playing in the mud is irresistible, and the first-ever event was a tremendous success. "We were only expecting 150-200 people for the spring event, and ended up with 550," said Greissmeyer. Race Day Events will host another Mud Run on October 31 (Halloween-themed, of course), which they expect to sell out with over 1,000 participants. Team entries are encouraged, with special team categories such as Fire/Police/EMS. And Greissmeyer makes sure that the event is family-friendly. "[The Mud Run] draws out anybody and everybody. It's not your typical crowd of elite runners. It's just families, high schoolers, people who really don't run much at all just out there having a good time," he said. And the enjoyment is genuine, to be certain. But it takes more than just goodwill to make sure that hundreds of people have a positive experience at events like these. Race Day Events crew members tend to details large and small, from rising at dawn to soak a field of soil with water (it turns out mud doesn't make itself), to ensuring that every corner is marked. In documenting these details, Thayer looked for the story elements inherent to each day's unfolding. Whether focusing on the swift footstrikes of runners or a cup of water offered in an outstretched hand, these are the elements that make a difference. Speaking of making a difference, Race Day Events quietly holds true to the greater community as well - making $2,300 of charitable donations in the first six months of 2010 alone. Whether focusing on the greater good or simply putting on a good race, though, Greissmeyer's goal is straightforward: "Trying to gauge what the participants want and trying to keep everyone as happy as possible." Judging from the smiles, the effort is right on the mark. Check out more images in the Madison MudRun 2010 and Lake Monona 20k Galleries. Did you participate in the Lake Monona 20km race or the Madison Mud Run? Tell us about it in the comments. To follow these and other stories, join the Focal Flame Photography Facebook page and follow our Twitter feed.